I Spy Animals: The Creature That Makes Perfume Smell Good...and Coffee Expensive!! The Creature That Makes Perfume Smell Good...and Coffee Expensive!! Here it is...but what is it? Raccoon? Fox? 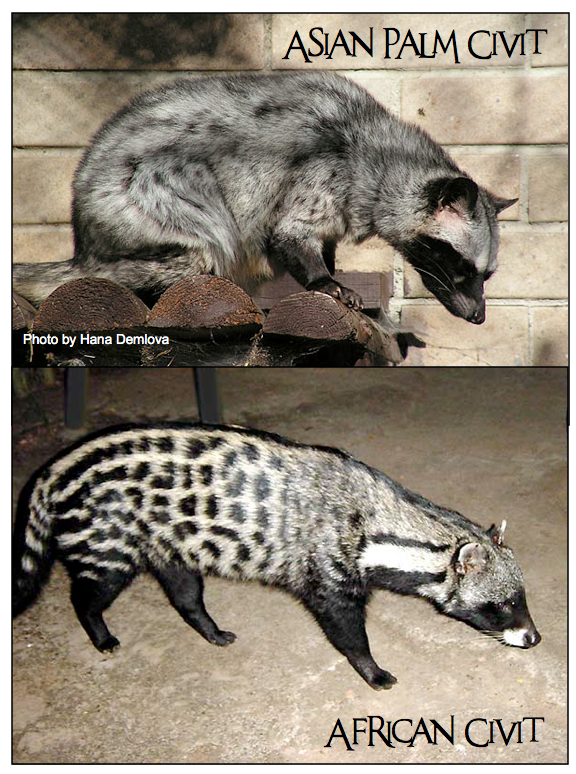 They're called toddycats in English, and musang in Malay. They live in trees, plains, rain forests, and river... and, if you live in Africa or Asia, they just might slip through your backyard at night. They're even kept as pets. They look like a cross between a weasel and a cat. Or a fox and a mongoose. Or maybe a dog and a lemur? Perhaps a...well, I could go on and on. Hose's Palm civit (not pictured) is the rarest and least known carnivore in the world, while the Otter civit, below, is just plain rare! Strange creatures, but two particular civits have been important to humans in very different ways. 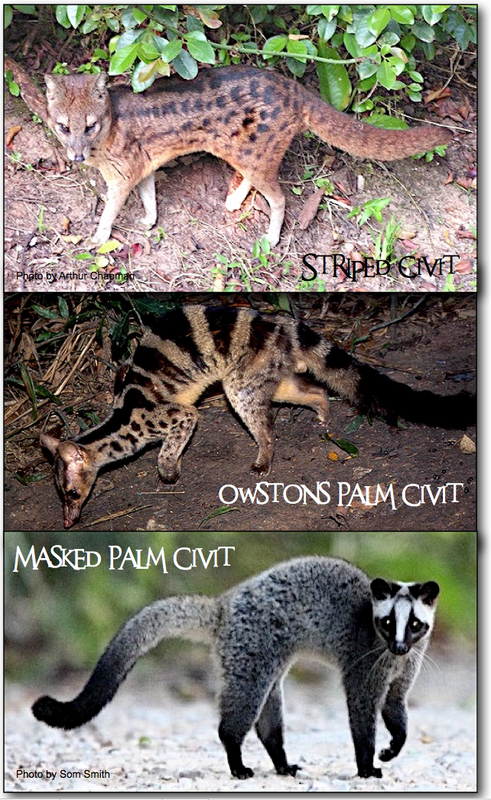 The Asian Palm civit: These guys are essential in the making of Kopi Luwak, the most expensive coffee in the world! They eat the flesh of the coffee "cherries" but expel the beans, which are then roasted and sold for around $600 per pound. I hear it's very tasty! The African civit: For centuries, perfume companies have obtained the musk (called "civit") from the African civit to scent and stabilize their perfumes. Where would Chanel No.5 be without the civit? 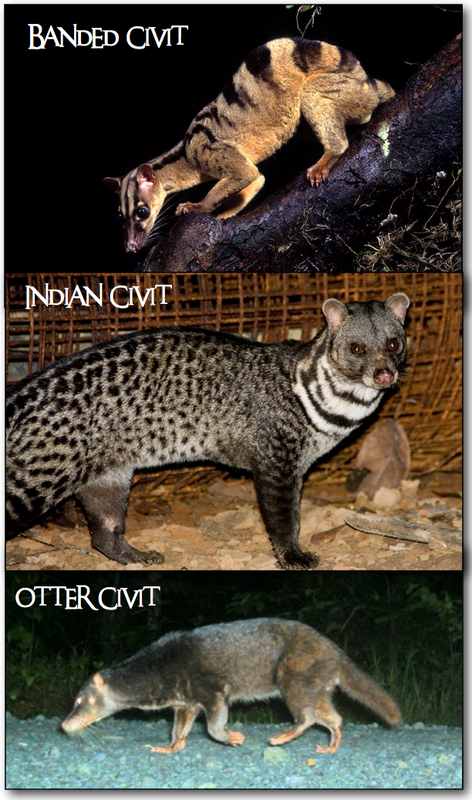 There are other creatures closely related to the civit...the genet, the fossa, and the linsang. Never heard of them? Well, let me introduce you! 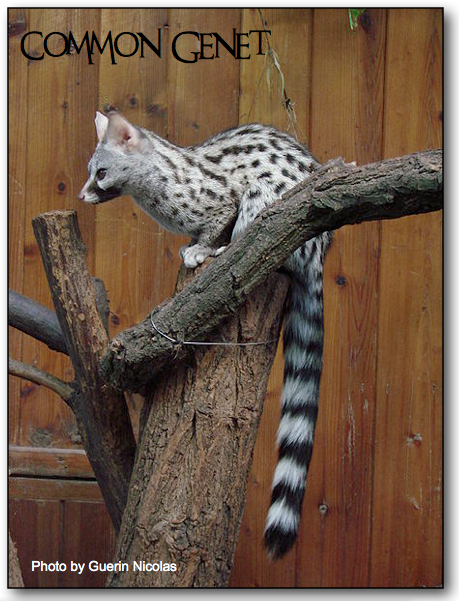 They look like civits, but genets can retract their claws...civits can't! 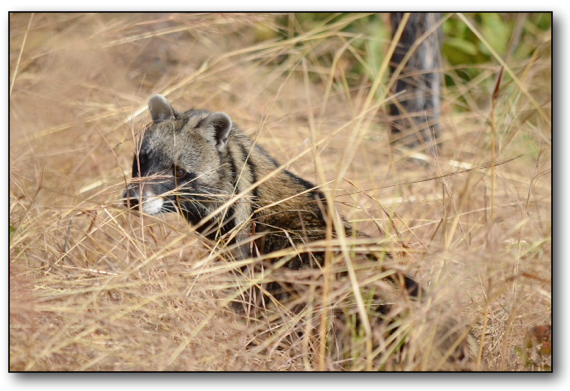 Check out the genet video below to see them in action. 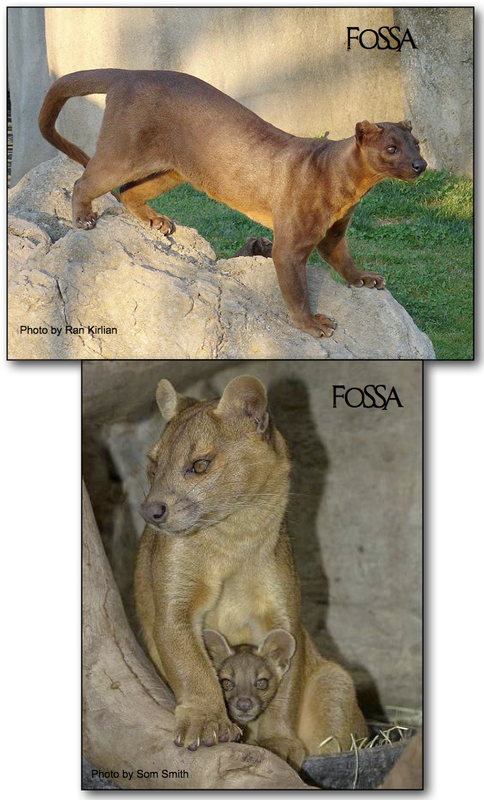 Only found on Madagascar, the fossa is the largest carnivore on that island. What does it eat? Lemurs! 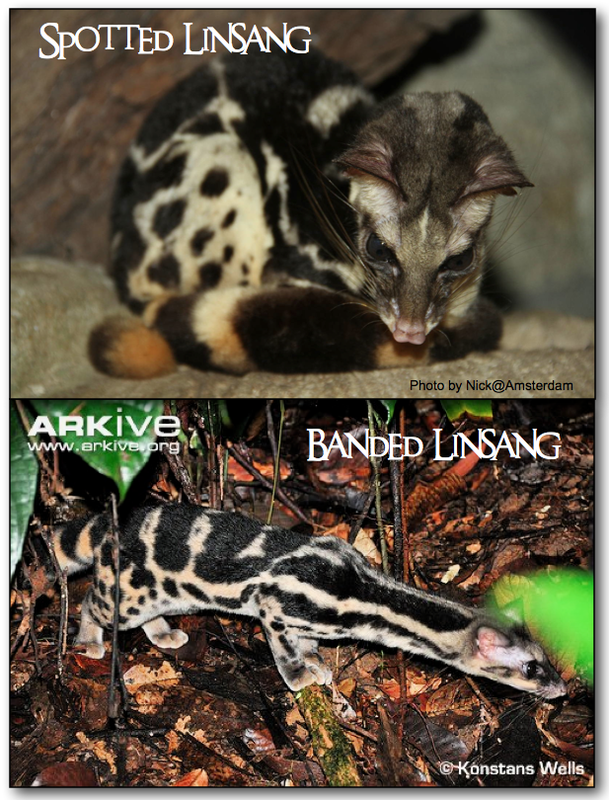 The closest relative to cats, the linsangs have retractable claws and eat...almost anything. So what do you think about the civit? Let me know! Answer to your question.... A leopard body a fox head and a raccoon tail. Which would make it a Leoxoon.